Sidney Denham, who devoted all his admiration to Abyssinians called them, „the children of gods.“ The resemblance of Abyssinians to the images of cats from the times of ancient Egypt and pharaohs suggests certain genetic links. The real origin of this breed of cats is not clear, and today it is almost impossible to track it back. Unfortunately this fact is true for many other breeds. There is a number of legends and hypothesis about the real origin of Abyssinians. Although it is not certain, it seems very trustworthy, that in 1868 a British lady, Ms. Barrett-Lenard, when returning with an army expedition from Abyssinia (the former name of Ethiopia) brought with her a cat named Zula. It is not known if there were more animals exported from this war affected region. It is quite probable that this was the beginning of breeding of Abyssinians in Europe. 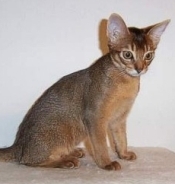 Ms. Barrett-Lenard crossed Zula with British short-hair tomcat, which resulted in considerable change of the appearance of Abyssinians in very short time. The elegant body build became more pronounced, formerly distinct colour of the hair became more compact and lost its exceptionality, stripes were more visible, and undesirable white spots begun to appear more and more on the chest. The Abyssinians, which were recognised as a distinct breed in England already in 1882, looked quite different from the contemporary type. 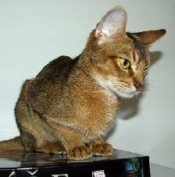 Soon, a group of British breeders introduced their inclination to give Abyssinians their original appearance. Among the most important features of this breed belongs also the natural one- colour hair without any spots or stripes. The first club of these cats, Abyssinian Cat Club, founded in 1929 in Great Britain, presented principles for Abyssinian breed, which in their basics are the same as the current rules. The first Abyssinian in the U.S. was registered in CFA already in 1917, and the following imports from England helped to the real bloom of breeding of these cats that are so popular in the U.S. At first, only „wild coloured“ cats (in U.S. called ruddy) were bred. The hair of this kind has a warm, brown and red hue, or it can be of brown tincture with some red shades and red ticking. The base of a hair is dark orange or apricot-like, and the belly and inner sides of legs are also of this colour. The end of ears and of the tail is black or in the colour called seal. The eye margins are lined black, the muffle is brick-like red and lined with black; the pads of paws, and the hairs in between the fingers are black or in seal. Now and then, there appeared a red Abyssinian (currently called sorrel) in the litter. For a long time, these animals were considered to be of flawed colour. Red cats are first mentioned in Great Britain already in 1887. This type of Abyssinians, however, was not recognised as a second acceptable colour by an international organisation FIFe until 1963. These cats have shiny copper-like red hair with chocolate brown ticking. The basic colour of the belly and the inner sides of legs is here dark apricot-like, the ears and the end of the tail is reddish brown. The eyes are lined also by reddish brown colour; the muffle is pink or even light red with reddish brown margins. The pads of paws are cinnamon- or chocolate-like coloured. The tuft of hairs in between the claws is again reddish brown. In 1982, two new variants of Abyssinians enriched the cat family – blue and fawn types were recognised by FIFe. The colour of blue Abyssinians is warm bluish grey with dark steel-like grey ticking. The hairs are light cream-coloured at the base, and the same colour can be found on the belly and inner parts of legs. Ears and the end of the tail are dark grey. The eyes and pink muffle are lined with bluish grey. The pads of paws are pink or bluish grey. The hairs in between the fingers are also dark bluish grey. The colour of fawn Abyssinians (formerly called beige) is dim beige with warm creamy ticking. The base of hairs, belly, and inner sides of legs must have light creamy colour. The tip of ears and of the tail is of dark creamy shades. The eyes and pink muffle have pinkish margin lines. The pads of paws are pink, and the hairs between fingers are dark creamy. Today, a silver type of Abyssinian cat is also bred. Blackish silver animals have silver white body with black ticking. The tip of ears is black or in seal, the end of the tail is black. The eyes and brick-like red muffle have black margins. The pads of paws and hairs between fingers are black or in seal. Bluish silver Abyssinians have also white body, but the ticking is dark blue. The ears and the end of tail are dark bluish grey. The eyes and pink muffle have dark bluish grey margins. The pads of paws are pink or bluish grey, the hairs between fingers are dark bluish grey. The reddish brown – silver variant has also white body but with reddish brown ticking. Ears and the end of the tail are reddish brown. The eyes and light red muffle have brown margin lines. The pads of paws are cinnamon- or chocolate-like coloured; the hairs between fingers are reddish brown. All types of Abyssinians enjoy distinct ticking, which is special coloured hair. Every single hair has two or three stripes. Light stripes alternate with dark ones and cause the typical natural appearance and look of the cat. This is especially true about sorrel and ruddy. These colours resemble the hair of a wild hare and Abyssinians are sometimes called „hare cats.“ Ideally, the body of Abyssinian should be without any spots. The typical eel-like stripe on the back of the animal, running on the whole length of the body to the tail, lines around eyes and the muffle, and the letter M on the forehead of the cat, shows that it is actually aguti colour. Abyssinian cats are of middle height, muscular, and brisk. Long, slim, and sinewy legs on slim oval paws enable the cat to get through the narrower space, not losing the balance even on a narrow window rims. The tail should be long, wide at the base, spiked at the end, and it should be in harmony with the whole body shape of the cat. The head is wedge-like, with wide forehead, small depression dividing the muzzle, and strong chin. Any overlap is not allowed. The muffle is of middle length with moderate depression, but without any „ceiling.“ Big ears are set wide apart, are lightly rounded at the ends, have tuft of hairs on the tips, and there is typical wild spot on the back of the ear. Big eyes in the shape of almond are very pronounced especially because of the lines on the margins and stripes in the inner corners of the eyes. Clear and intensive colours of eyes are most desirable (amber, green, or yellow). The hair is short, soft, and closely adjoining. White colour is allowed only on a chin and nostrils, it should never appear on the neck or chest. It is easy to care for the hair of this breed. It is usually enough to comb the animal once a week, but when the cat loses its hair it needs to be done more often. The nature of Abyssinians is characterized by temperament, curiosity, playfulness, and the joy from climbing high places. The cat happily takes part of any happenings around and is not shy even of strangers. This cat should be offered enough space for cheerful play and certainly should have a tree for scratching. People working whole day should decide for “double package” right from the beginning because these cats love society and would be soon bored if left alone. They often don’t lose their playfulness up till old age. They are loyal to their human friends and love resting on his-her lap, which they show by loud purring. They look for this kind of rest especially after long time of running about and become tired. We also shouldn’t underestimate communication. Abyssinians tell their owners all their feelings through silent melodic sounds, which is almost like a ritual needed for them to feel good and satisfied. Thanks to this exceptional ability to communicate, these cats can bring up their owner very quickly, although the man/woman may think he/she is the one who brings up another being. You can never get bored with Abyssinian cat because she will always surprise you with new ideas and cunning plans. When you lose your heart for Abyssinian cat you always come back to her.